"Trees become bushes; barns, toys; cows turn into rabbits as we climb. I lose all conscious connection with the past. I live only in the moment in this strange, unmortal space, crowded with beauty, pierced with danger. The horizon retreats, and veils itself in haze. The great, squared fields of Nebraska become patchwork on a planet’s disk." (The Spirit of St. Louis). But two months later, before he could make his first solo flight, Lindbergh left the company that sold their training planes. 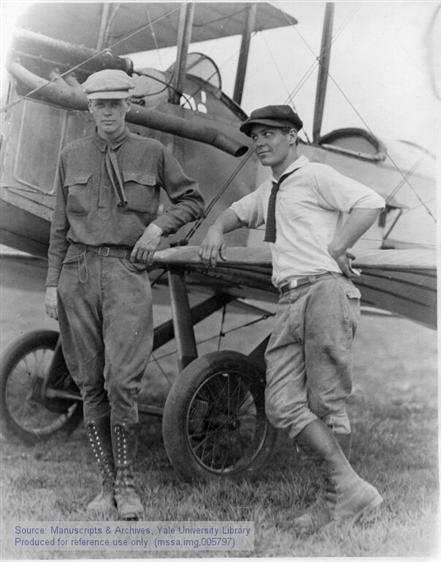 Charles A. Lindbergh with Bud Gurney in St. Louis. Photo courtesy Yale University Library. “Barnstorming” was the term created for the traveling stunt flying that became popular in the early days of aviation. In order to gain more flight experience and to earn money for lessons, Lindbergh joined Errold G. Bahl’s barnstorming crew as a wing walker and parachutist. After about a month, Lindbergh returned to Lincoln to work at the Nebraska Aircraft Corporation. It was during this time that he met parachute maker Lt. Charles Hardin, who taught him how to make a “double jump,” in which one chute opens and is discarded, allowing a second chute to deliver the jumper to the ground. C.A. accepted his son’s career choice and agreed to finance the purchase of his first airplane, a Curtiss JN4-D, commonly called a “Jenny.” The plane was a two-place, open tandem-cockpit biplane that had been used for training during the war. Lindbergh bought the plane from Souther Field in Georgia. He later wrote, “Everybody at Souther Field took for granted that I was an experienced pilot when I arrived to buy a plane. They didn’t ask to see my license, because you didn’t have to have a license to fly an airplane in 1923." It was at Souther Field, flying in his newly acquired Jenny, that Lindbergh made his first solo flight. Lindbergh flew the plane back to Minnesota, barnstorming along the way. He then used the plane to support his father's run for Senate. On June 3, 1923, Lindbergh took his father up, instructing him to throw hundreds of handbills from the plane. Later he recalled, “it did not occur to me that he might throw them out all at once, but he did, and the thick stack of sheets struck the stabilizer with a thud." The plane, with both father and son aboard, hit the ground in what Lindbergh insisted on referring to as a “crack-up,” instead of the more serious “crash.” The plane did little good in helping the senior Lindbergh’s run for office, which he lost. 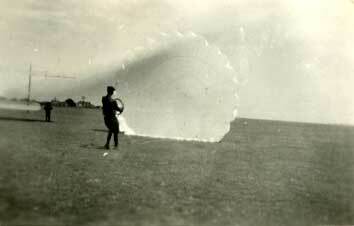 Charles A. Lindbergh with parachute. Source: MNHS Collections. Allard, Noel E. and Gerald N. Sandvick. Minnesota Aviation History: 1857-1945. Chaska, MN: MAHB Publishing, Inc., 1993. Lindbergh, Charles A. The Spirit of St. Louis. New York: Charles Scribner’s Sons, 1953.